Is your database slowing down your business? Are you using Linux as a platform but can’t find the right database that meets your performance needs without busting your budget? Built on the industry recognized “it just runs faster” SQL Server 2016 engine, SQL Server 2017 provides new capabilities for performance, value, and choice. 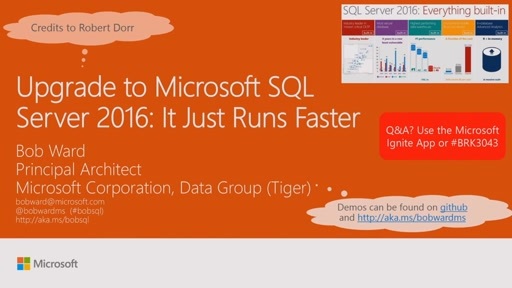 In this session, we show you features and a “behind the scenes look” at what powers SQL Server 2017 for Linux and Windows. And if you are a database expert and want to tune the SQL Server engine to its maximum turbocharged capacity, we show you the tools, diagnostics, and techniques that make SQL Server 2017 the ultimate database platform choice to run your applications at a fast and furious speed.